One good hike with a foster dog certainly deserves another. 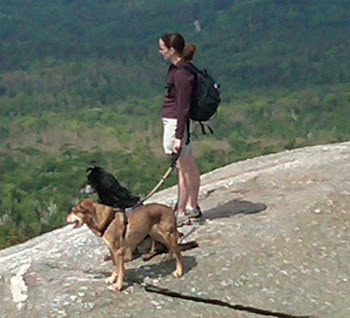 Bertie, a dog who is searching for her forever home after being rescued from an overcrowded animal shelter, bagged her second peak in two weeks last Sunday, July 31, 2011 when she reached the 3,121 ft. summit of Mt. Cardigan. This very popular hiking destination is located in the towns of Orange and Alexandria, New Hampshire and is part of the Cardigan Mountain State Park. Bertie proved once again that she is the perfect companion in the car and on the trail. She playfully greeted fellow hikers and their canine companions throughout our journey along the West Ridge Trail. We met a very tall, dark and handsome Bernese mountain dog named Timber. He was rather impressive and very friendly. We couldn't help but wonder how passersby may react to hearing his guardians call out to him, "Timber!". Bertie was especially interested in meeting and greeting the young children we encountered along the way. She is obviously very comfortable interacting with people and animals of all ages and sizes. In addition to the many dogs Bertie has met on her hikes up Mt. Kearsarge and Mt. Cardigan, she also currently shares her foster home with a mixed breed named Joey and three cats. Time for a close up of that spotted tongue. While I would certainly welcome the opportunity to hike with Bertie a third time, I am hopeful that this adorable Chow Chow/Spaniel mix will next cross my path on a hike where she is in the company of her new family. Be sure to visit and share Bertie's profile on Petfinder.com and help find her a home. Additional photos of Bertie's journey are available in album on the Foster Dog Summit fan page and a short video clip of her at the summit of Mt. Cardigan appears below. Rescue organizations such as Canine Guardians for Life, Inc. rely on the availability of foster families to ensure a safe and healthy stay for dogs who are waiting for their forever homes. If you are not ready to make a long term commitment to adopt another pet but would like to consider hosting a dog temporarily, we invite you to learn more about becoming a foster family for a dog in need of rescue. Fabulous photos and beautifully written!!! I can't tell you how grateful BERTIE and we all are to be a part of your wonderful program!! Do I understand correctly that you are not the foster parent, but are taking other people's foster pups for a hike? Either way, what a lovely idea! Thank you, Judith. I am thrilled to be able to assist the foster dogs at Canine Guardians for Life, Inc. I am grateful for your support! Beth, yes the dogs are currently living in foster homes through the rescue organization Canine Guardians for Life, Inc. They are not my foster dogs - I simply borrow them for the hikes. Thank you for your kind words!